If the existing jambs are ruined, out of plumb or just plain ugly, install a prehung door unit, which comes attached to its jambs with the hinges already in place. If the door is properly sized for your door opening, all you'll have to do is square the assembly with shims and nail it into place. 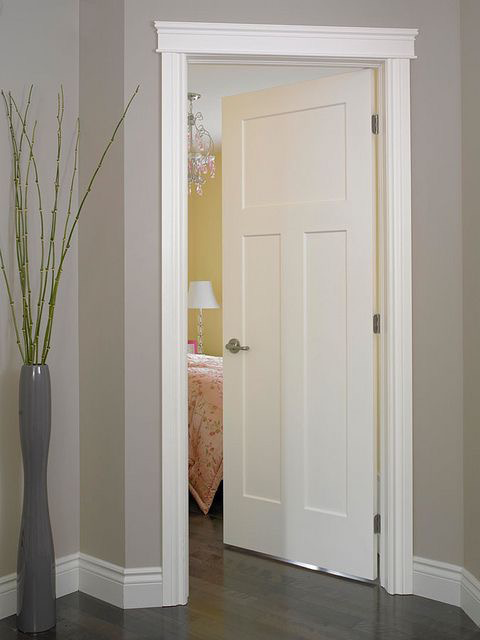 If the door jambs are in good shape and the door itself is all that needs to be replaced, you can purchase a door blank or slab to replace the one you're removing. This is just the door itself with no associated trim; sized to fit into the existing door jambs. The doorframe, jambs and existing trim remain intact. This may seem like the easiest option, but unless you have finish carpentry experience, it's actually easier to install a prehung door unit. Installing only the door requires you to locate and mortise slots for hinges and bore knob and latch holes to align with the existing strike plate.